We are now seeking nominations for the 2018 Ohio Conference AAUP Board of Trustees' elections. In accordance with our governing document, you must have been a member for at least two years and current on your dues to be eligible for a trustee position. Nominations should be sent to Sara Kilpatrick, Executive Director, at sara@ocaaup.org no later than January 30, 2018. Below is the list of positions to be elected directly through the Conference elections this year. Those who are elected will serve a two-year term beginning September 1, 2018. The President shall preside at Conference meetings and, with the approval of the Trustees, arrange for the Conference meetings and appoint Chairs of the standing committees; shall execute such matters as are referred to him or her at Conference meetings and by the Trustees; and, in consultation with the Trustees, shall take such other actions as are judged necessary to carry out the objectives of the Ohio Conference, and shall report at the next Conference meeting any actions taken by the Trustees during the time between meetings. The President shall serve as delegate to the Annual National AAUP meeting and to the Annual meeting of the Assembly of State Conferences. The Secretary shall keep the Ohio Conference records, including minutes of meetings of the Trustees and of the Conference. The Secretary shall serve as a delegate to the Annual meeting of the Assembly of State Conferences. The Conference has four Saturday Board meetings in Columbus each academic year that trustees are expected to attend, one of which is the Annual Meeting. They also oversee the executive director and provide direction for the organization. Serving on the Board of Trustees is a rewarding way to engage in statewide AAUP issues and state government advocacy. If you have any questions, contact Sara Kilpatrick at sara@ocaaup.org. 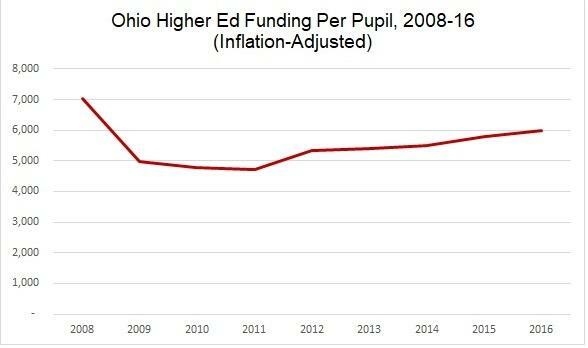 The greatest challenge that Ohio colleges and universities have faced is inadequate funding from the state. State funding has directly caused tuition increases, faculty lay-offs, decrease in student support services, and many other problems. In our report, Education First, we point out that Ohio ranks in the bottom third for adults with degrees, even though Ohio ranks fifth in number of higher education institutions. Lack of affordability is preventing students from earning degrees. We showed that in the last fiscal year, the state spent less on State Share of Instruction (SSI) than it spent six years ago under Gov. Strickland's last budget. 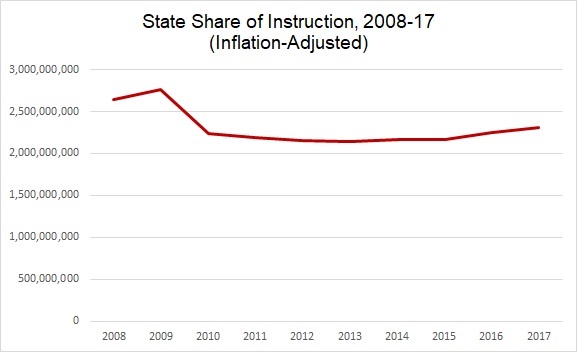 Recently, the Center on Policy and Budget Priorities released a report showing that, when adjusted for inflation, State Share of Instruction funding and per student funding have declined significantly since 2008 (-13% and -15.2%, respectively), as can be seen in the graphs below. In our report, we also addressed the new "performance-based" university funding formula that was adopted four years ago. Whereas state funding used to be based on enrollment, the state radically changed the funding model to one mostly based on course completions and graduations. This model favors selective institutions like Miami and Ohio State, who have more students who will be academically successful, while harming open-access institutions and the students they serve. Researchers at Columbia University, who studied the impact of the new funding formula in Ohio in 2015, found that the state’s universities were moving resources from financially-needy students to merit students who were more likely to pass classes and graduate and thus generate financial return. Unfortunately, the new funding formula remains, and in the recently-passed state budget, higher education funding will remain flat in the current and next fiscal years. This highlights the importance of electing policymakers who value higher education and understand that the state cannot tax cut its way to success -- we must have fair and responsible taxation and budgeting policies that ensure the state has revenue to invest in things like public higher education.